My personal antagonism for the Nipponese is an aggravated accumulation of clandestine "so sorry" incidents which were inflicted upon China and her people. I was forced by circumstantial reoccurrences to develop this deliberate hatred for the Japanese ever since I learned to write my Chinese name. By nature, I detest conflicts of all sorts, but I have seldom failed to witness the raging psychological reaction of a red-blooded people when they are humiliated and deprived of their integral rights for freedom. I returned to the good U.S.A. in 1938 to continue my education. Then within the next three years the contagious turmoil of war plagued the world. I enlisted in 1943 and joined the Air Corps with ardent endeavor to offer my humble services to the great cause. Eventually, I was permanently assigned to the 5th Air Force, 380th Heavy Bombardment Group, famously known as the "Flying Circus." Fragments of my first combat mission made a deep impression in my mind and no doubt, will linger for a long time to come. I wish to share these incongruent reminiscences with those who are interested. I have never received anything with such whole-hearted enthusiasm in my brief military career. It was the inevitable news of my first combat mission over enemy territory. All my intensified training in the Air Corps has been laboriously leading up to this momentous task. Through seemingly endless months of waiting and suspense ... and now my heart palpitated to the joyous harbinger of the day. The night previous to the mission, I ventured into the squadron intelligence office to study charts and reconnaissance photos of the target area. A heated discussion of prominent target recognition points was in full progress among the S-2 officer and the lead bombardiers. One could almost hear their busy minds functioning as these veterans of aerial warfare thrashed out various points of importance. I, for one who was yet to be initiated in actual combat experience, thought it extremely advisable to just listen and absorb their technical conversation. Later when the discussion came to an unanimous conclusion, Lt. French, squadron navigator, came over to the front of the room and laid his navigation instruments on the spread-out charts and maps. "Poy, you're going on tomorrow's mission, too, aren't you? It won't be too rough, mostly coastline pilotage and D.R. ... nothing to worry about!" I wasn't absolutely without confidence in my Air Corps profession because I figured: 'If any navigator can successfully navigate a B-24N across the vast Pacific, he has an adequate knowledge of navigation.' Frenchie is a fine fellow, humorous at times, but in all seriousness, he is competent when confronted with any problem concerning navigation. I watched him plot his course, calculate E.T.A.s and headings enroute to the initial point and then to the target. He went over some of the major check points with me and then suggested that I had better hit the sack because it was going to be a long and tedious mission tomorrow. It was pitch dark when I was awakened by a noncom. The early morning air seemed invigorating and for obvious reasons, I did not go through the drowsiness which usually succeeds reveille on ordinary days. My pulse must have been abnormal because I was ready ... come hell or high water! I crawled into my flying clothes, gathered my gear and headed for the mess hall for an early breakfast. The briefing was short. A consecutive string of briefing officers harangued over the details which were emphasized the night before. I collected the charts, maps, and target folder from the S-2 officer and boarded the awaiting trucks. "Pug," an elegant bird of 60 some odd missions, was our baby. A large portrait of the mischievous adolescent carrying a bomb decorated the left panel of the nose compartment. Our pilot, copilot, and engineer made the routine pre-flight inspection with utmost scrutiny. Everyone checked their respective positions and battle stations for perfect performance, and then stood by for take-off orders. There wasn't much conversation among us and a tense atmosphere was much in evidence. "Switch on!" bellowed Sammy, the crew chief who was standing fire guard. "Switch on!" echoed the pilot. Then the engines whined and sputtered and engaged into an anguish rotary motion. Out of the fading darkness, the whole field became vivid with life. The war cry of air rage surmounted in unison. We taxied into position and left Sammy standing back there proudly waving his hand to us as a gesture of good luck ... and probably silently praying to God to bring us back safely. The bombers took off at precise intervals. It was our turn. The pilot gunned the engines and the plane lunged forward with a sudden surge of energy. We went racing down the long runway with the power of 4,400 horses. The steel matting beneath clattered under rolling pressure. As our air speed increased, the mighty plane ascended gracefully with her heavy load of bombs. The renowned and respected "Flying Circus" was on the loose again. Our squadron formation headed out toward the blue waters of the South China Sea to parallel the coast line of Mindoro, going north. The rippling sea below was calm and the air had a tinge of coolness. By this time the glowing sun had risen a rod's length from the eastern horizon. I charted and plotted our course and calculated E.T.A.s for major check points and positions. This was my job. This was the opportunity I was looking forward to with eager anticipation. Group rendezvous was an island in the archipelago off the Lingayen Gulf. Lingayen Gulf! Yes, this proper noun had been obscure to the common student of geography until it appeared twice in the history of world current events. I was aware of the name in 1942 ... and then a period of terror and madness reigned over the territory. Almost three years later, the name Lingayen was reiterated again, only this time joyously and triumphantly! I glanced below in solemn pride to watch the lapping waters of the gulf wash the wounds and blood shed from the beautiful shores. By this time scores of B-24s were arriving and swarming about the area. When the predetermined second registered on our synchronized watches, the enormous formation took form and continued northward to Formosa. I was busy recording instrument readings and converted the results in my log and charts. Approximately two hours later, a silhouette of dark purple mountains loomed out of the clouds. All battle stations were manned. The gunners were manipulating their gun grips and incessantly scanning the sky for possible fighter interception. This was enemy territory. By rights, this island of natural resources belonged to the Chinese, but was annexed to the Japanese Empire in 1896 as indemnity for the Sino-Japanese War ... Our enemy's first step toward a fantastic world conquest. Okayama Airdrome lies on the western coast of Formosa, 67 nautical miles north of the southern tip. Our initial point was a fixed position out at sea. At the indicated time the entire formation swung eastward toward the target. Okayama City lay sprawled and lifeless before us. 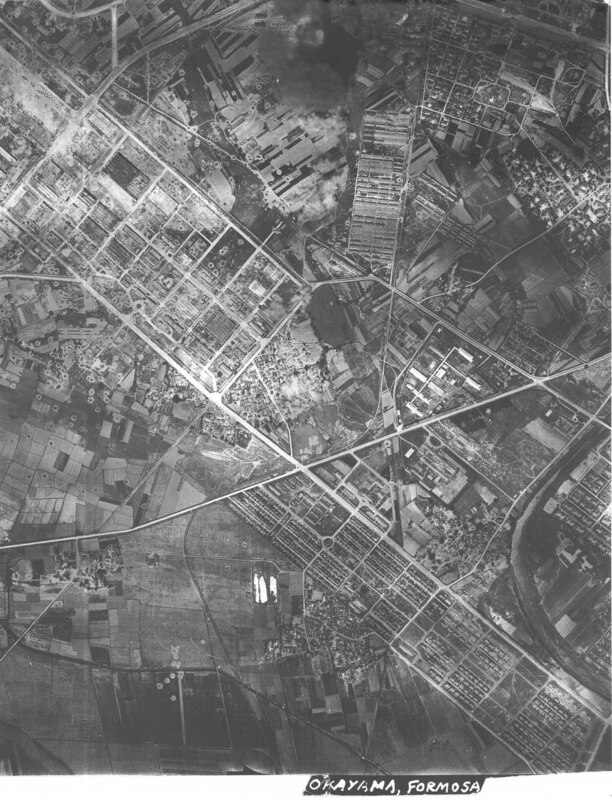 The airdrome, south by southeast from the city. Enemy ack-ack guns began to bark obtrusively. The formation zigzagged into evasive action as we headed steadily toward the target. "Bomb bay doors open!" came the voice through the interphone. Bombardiers were in their glory now, training their signs on aiming points with nth degree of precision. During the bomb run, it was my duty to lean out into the bomb bay with one hand on the bomb bay door handle and score the hits of the bombs. Suddenly, the bomb release mechanism began to click. Bombs descended in trail, whistling and shrieking as they fell ... raining obliteration and devastation on the implements of a fanatical war machine. Bombs struck the target area, exploding with ferocity and destruction, spreading dust, smoke, and flames on the military installations below. This was the moment of revenge I've been impatiently waiting for. A quick flashback went through my head ... It was on July 9, 1937, when the Japanese first sent bombers over Nanking, then Capitol of China. I was at school when it happened; bombs, incendiaries dropping everywhere; shrapnel flying. The earth trembled with terror. It amazed me how I got out of the ordeal alive ... Again, when I was on Canton, bombed out of school and nearly blasted out of home. Some of my school chums, neighbors were among the less fortunate ... These grim memories of lack-luster days gone by went racing before my eyes. Now the cards were turned in reverse. I was holding the trump suit! Giving the fanatic enemy a dose of their own medicine! It pleased me beyond literary expression to watch the bombs rip the target apart. I clocked the time bombs were away; closed the bomb bay doors; and resumed my position. We were breaking away from the target now. Flak bursts mushroomed on all sides, leaving black puffs of smoke to harass and reluctantly disappear from our anxiety. As we turned out toward sea again, I took one last glimpse at the job we had just performed. Large fires burning, oil smoke rising into the heights! What a sight! I found myself silently reveling upon the satisfaction that my participation, though infinitely small, was accredited to the success of this mission.